"Mr. Lambert, it seems you haven't been exactly truthful with us." 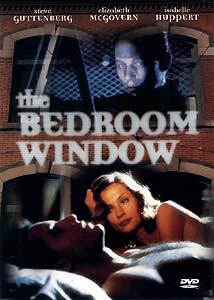 The Bedroom Window is a 1987 thriller written and directed by Curtis Hanson based on Anne Holden's novel The Witnesses. Steve Guttenberg stars as Terry Lambert, an architect who becomes involved with his boss's wife Sylvia (Isabelle Huppert.) During their first night together, Sylvia witnesses an attempted abduction in the street below Lambert's apartment but is unwilling to go to the police. When the abduction attempt is linked to another murder, Lambert attempts to do the right thing by "fronting" Sylvia's eyewitness account to help catch the killer. Unable to identify the culprit in a lineup, he begins his own investigation aided by the young woman (Elizabeth McGovern) whose attempted abduction Sylvia witnessed. Further murders follow as Lambert himself becomes a prime suspect. The Bedroom Window is meant to be a crime drama in the Hitchcockian mold—it approximates some of the master's qualities but never achieves the same levels of tension or drama. Hanson's direction is visually stylish, using a near-monochrome palette with spots of bright color in his skillfully backlit nighttime scenes, and he achieves a sharp, legible neo-film noir look using modern color film stock, no mean feat. The technical production is solid, with open set designs that contrast nicely with the film's often-claustrophobic, paranoid tone, and the cast's performances are uniformly sound. But the script has problems—Lambert seems hopelessly naïve (or stupid) and makes bad decisions throughout, Sylvia's personality changes to suit the needs of the plot, and the overall story seems contrived, largely driven by coincidence and chance. It's hard to buy happy-go-lucky Steve Guttenberg as a man who would seduce another man's wife, let alone a potential killer, and the real killer (Brad Greenquist) never develops into a truly scary presence—he's a sketchily drawn "bogeyman" whose early and frequent contact with the protagonists robs him of whatever screen power he might have had. The film is also in need of some tightening—it takes several side trips that provide little new information, and the pacing doesn't pick up until the last twenty minutes. There are a few moments of real drama in this end sequence, and the naturalistic script doesn't succumb completely to its by-the-numbers plot, but the "shocking twists" are anything but and the conclusion seems a long time coming. The Bedroom Window is interesting as a precursor to director Hanson's L.A. Confidential, and it's better than the innumerable Andrew Stevens/Shannon Tweed entries in the same genre, but the whole affair is on the dull side. Image Transfer Review: Anchor Bay presents The Bedroom Window in its original 2.35:1 widescreen theatrical aspect ratio with an excellent anamorphic image. This film presents some difficult compression challenges, with lots of rain, darkness and wet pavement, and the DVD rises admirably to the occasion. A dual-layer disc has been devoted to this two-hour movie, and the high bitrate keeps shadow detail, background texture and motion clear and vivid with no compression artifacts or softness that can't be attributed to the 1987 source. The print used is very clean with few signs of dirt or emulsion flaking, black level is solid, and the film's often-stylized use of color is preserved by this fine digital transfer. Audio Transfer Review: The Bedroom Window features one of the better monophonic soundtracks I've heard, presented in Dolby Digital 1.0. Dialogue is clear, the saxophone-heavy score is smooth, and sound effects are full-bodied. The audio uses volume levels intelligently to produce a convincing illusion of depth and space through a single speaker. Subwoofer-level bass is completely absent and sorely missed in a few key scenes, but this is a well-engineered mono soundtrack nicely mastered for DVD. Extras Review: Anchor Bay's DVD of The Bedroom Window features very little supplemental material, just the theatrical trailer in its original 2.35:1 aspect ratio. The trailer is nicely transferred, though visibly lacking in detail compared to the excellent quality of the main attraction. The chapter-list insert card in the keepcase reproduces what appears to be the original poster art for the film. The Bedroom Window is a straightforward and derivative but stylish thriller with an excellent DVD transfer courtesy of Anchor Bay. The film may not stand up to repeat viewings, and the disc has no substantial supplements, but it's worth a rental.